Версия игрового клиента Dota 2 была обновлена до версии 7.20. В сегодняшнем патче разработчики игры переработали большое количество предметов и некоторые способности героев, систему денаев. Кроме того, была обновлена карта, на которой происходят сражения. Крипы дальнего боя — 9-11 золота. Boots of Travel теперь не использует общий счетчик перезарядки с Town Portal Scroll. При использовании предмета 10 секунд добавятся к счетчику перезарядки Town Portal Scroll. Стаки нейтралов теперь дают 35% награды вместо 25%. Все нейтралы, кроме древних, теперь дают на 5% больше золота при убийстве. Выбрать случайных героев теперь можно не позднее второго пика в вашей команде. Святыни: с 24 на 17;. Переработана и упрощена система награды опыта за убийство героев. Больше не включает компонент «опыт команды». БазовыйОпытЗаСмертьГероя: базовое значение опыта в качестве награды за убийства. Регенерация здоровья: Переработаны показатели регенерации в соответствии с изменением формулы. Следующие источники оцепенения теперь не отменяют применяющиеся (Channeling) способности или текущее действие: Dark Troll Ensnare, Searing Chains, Naga Siren Ensnare, Crystal Maiden Frostbite, Entangling Claws, Nature’s Guise и Overgrowth. изменено вычисление входящего по иллюзиям урона. Теперь это происходит в последнюю очередь. 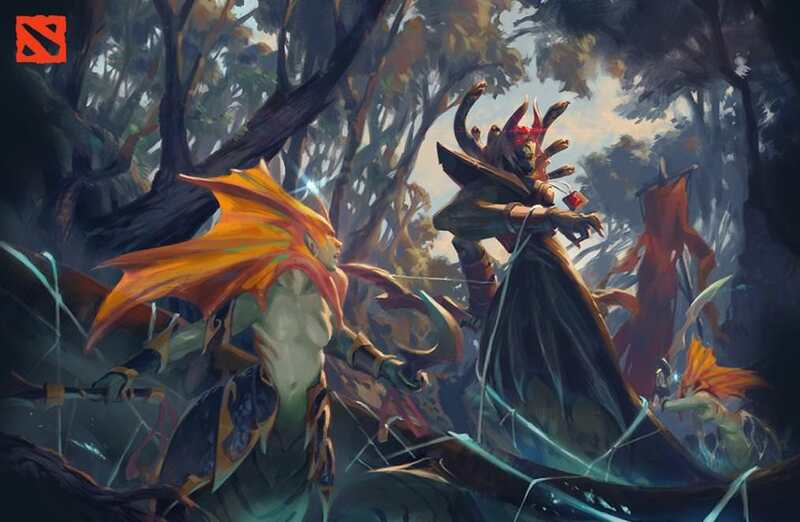 Такие же изменения для Splash-урона Dragon Knight. Следующие способности теперь не проходят сквозь иммунитет к магии: Curse of Avernus, Acid Spray, Bloodrage, Thirst, Elder Dragon Form, Lycan Wolf Cripple, Epicenter, Entangling Claws, Spiderling’s Poison Sting, Anchor Smash, Nature’s Guise, Wave of Terror, Venomancer’s Poison Sting, The Swarm, Maledict debuff, Ghost Frost Attack, Wrath of Nature, Netherward Mana Degen, Life Drain, Primal Roar Secondary Knockback, Requiem of Souls, March of the Machines collision, Atrophy Aura, Tombstone, Flesh Golem, Wall of Replica slow, Naga Siren Ensnare, Dark Troll Summoner Ensnare, Wild Axes, Natural Order, Death Pulse projectile, Assassinate, Shiva’s Guard Aura, Assault Cuirass Aura, Tempest Tornado Aura и Orb of Venom. Hex теперь снова можно снять сильными развеиваниями. Здоровье крепости увеличено с 4250 до 4500. Добавлена новая игровая механика — привязка (Leashed). Юниты под привязкой теперь действуют таким же образом, как и под оцепенением, однако могут использовать телепорт и способности, связанные с передвижением, но не могут передвигаться обычным способом. Бонус к атрибутам увеличен с 10 до 12. Теперь не отключаются когда вы атакуете крипов. Теперь дает +12% к сопротивлению эффектам вместо Maim (замедление). Теперь дает +14% к сопротивлению эффектам вместо Maim (замедление). Теперь дает +16% к сопротивлению эффектам вместо Maim (замедление). Kaya and Sange: +16 к интеллекту и силе; +16% к уменьшению расхода маны и сопротивлению эффектам; +12% к урону от способностей; +12 к урону. Можно улучшить до Heart of Tarrasque и Holy Locket. Увеличивает любое лечение и увеличение регенерации здоровья от вашего героя на 25%. Дает: +200 к здоровью, +4 к регенерации здоровья, +3 к регенерации маны и +15% к устойчивости к магии. Активная способность: используется на союзника или врага, лишая носителя 12-ти единиц бонусной брони. Союзникам дает +70 к скорости атаки, +10% к скорости передвижения и +12 к броне. На врагов накладывает те же эффекты, но с отрицательными значениями. Используется в качестве составного компонента в предметах, ранее требовавших Bracer, Wraith Band или Null Talisman для покупки. Бонус к атрибутам этих предметов увеличен с 7 до 8. Теперь дает +3% к урону от способностей. Теперь требует рецепт стоимостью 450 золота. Регенерация маны увеличена с 0.5 до 0.65 единицы. Может быть использован, чтобы перенести 60% текущего запаса маны в здоровье. Перезарядка: 250 секунд. Дает +50% к сопротивлению эффектам во время действия активной способности на протяжении 2,5 секунды. Бонус к урону уменьшен с 50 до 25. Now requires Reaver, Vitality Booster, Ring of Tarrasque and 400 gold recipe. Enemy damage per second increased from 20 to 25. Headdress Recipe reduced from 300 to 175. Recipe increased from 900 to 950. Mana restore increased from 135 to 160. Mana restore increased from 160 to 200. Now gives the +2 Stats from its components. Recipe cost reduced from 1000 to 900. No longer has an active ability. Bonus damage increased from +30 to +38. Armor reduction increased from 6 to 7. Can now override Slark’s Pounce. Attack Speed increased from 30 to 40. Range increased from 850 to 1000. Grants 300 ground vision to the team that last held until it is picked up. Cost reduced from 1100 to 900. Damage reduced from +20 to +10. Level 25 Talent changed from Curse of Avernus to +375 AoE Mist Coil. Reworked Chilling Touch. It is now a passive autocast attack modifier. Cooldown: 15/11/7/3 seconds. Grants you bonus attack range and causes your attack to deal heavy magic damage that slows movement for a brief period. Damage: 50/85/120/155. Slow: 100% for 0.5 seconds. Attack Range Bonus: 60/120/180/240. Manacost: 30/50/70/90. Replaced Spell Shield with Counterspell. Passively grants you 15/25/35/45% Magic Resistance and can be activated to provide a Counterspell shield for 1.4 second. Causes all spells that target you to be blocked and reflected onto the enemy. Cooldown: 15/11/7/3. Manacost: 40. Level 15 Talent changed from +350 Health to +300. Berserker’s Call armor bonus reduced from 40 to 30. Level 20 Talent changed from +100 Enfeeble Damage Reduction to +100 Enfeeble Attack Speed Reduction. Flaming Lasso now does 20/40/60 damage per second. Primal Roar secondary unit slow increased from 50 to 60. Level 25 Talent changed from +2 Hawks Summoned to -15s Hawks Cooldown. Thirst movement speed increased from 7/18/29/40% to 12/24/36/48%. Level 20 Talent changed from +18% Rupture Damage to +600 Rupture Cast Range. Level 20 Talent changed from +125% Jinada Critical Strike to +90 Jinada Gold Steal. Level 25 changed from +15% Drunken Brawler Chance to +200% Critical Strike Damage. Spiderling/Spiderite magic resistance reduced from 50% to 40%. Double Edge cast point from 0.5 to 0.4. Level 20 Talent changed from +300 Double Edge Damage to +50 Return Damage. Level 25 Talent changed from -7 Reality Rift Armor Reduction to -2s Chaos Strike Cooldown. Level 15 Talent changed from -10s Test of Faith Cooldown to -10s Divine Favor Cooldown. Power Cogs mana burn from 50/100/150/200 to 50/80/110/140. Freezing Field no longer has a 0.3 cast point. Wall of Replica slow reduced from 75% to 50/60/70%. Level 25 Talent changed from -4s Shadow Wave Cooldown to +40% Poison Touch Slow. Spirit Siphon now drains 4/6/8/10% speed. Thunder Strike damage increased from 40/60/80/100 to 45/70/95/120. Base attack range increased from 150 to 175. Level 10 Talent changed from +10 Scorched Earth Damage/Heal to +20 Scorched Earth Damage. Elder Dragon Form Splash Attack no longer does partial damage if the attack misses. Level 25 Talent changed from +20% Precision Aura Damage to +25% Precision Aura Attack Speed. Fissure cooldown increased from 18/17/16/15 to 21/19/17/15. Level 25 Talent changed from +1s Boulder Smash Stun duration to +0.75s Rolling Boulder Stun Duration. Level 25 Talent changed from +100% Lifesteal to Astral Spirit Grants Spell Immunity. Fire Remnant now does damage along the way (at half radius) instead of only at the destination. Base movement speed reduced from 300 to 290. Level 15 Talent from +100 Time Lock Damage to +70. Level 20 Talent changed from +2 Hits to Kill Phantom to +1. Level 25 Talent increased from +150 Attack Range to +175. Spirits Cooldown increased from 26/22/18/14 to 26/24/22/20. Macropyre damage now lingers on the affected units for 2 seconds. Omnislash no longer instantly kills creeps. Level 25 Talent changed from +2s Mana Leak Stun to +2 Will-O-Wisp Flicke. Winning a Duel automatically casts Press the Attack on you. Level 25 Talent increased from Ice Armor Provides +30 HP Regen to Frost Shield Provides +60 HP Regen. Level 25 Talent changed from +2% Current Health to +1% Max Health. Finger of Death now gets stronger with each kill. Gains +50 Damage per hero kill. If the enemy dies within 3 seconds of being hit by the ability, the bonus is still granted. Replaced Rabid with Spirit Link. Grants both of you 30/50/70/90 Attack Speed and causes 40/50/60/70% of damage you deal to restore life to your Spirit Bear, and damage your Spirit Bear deals to restore life to you. Duration: 10 seconds. Cooldown: 42/34/26/18. Manacost: 50/60/70/80. Lunar Blessing now provides +8/14/20/26 Primary Attribute bonus as the aura bonus, rather than bonus damage. Level 15 Talent changed from +24 Lunar Blessing Damage to +14 Lunar Blessing Attributes. Reworked Shockwave. Releases a wave towards a target point, pulls units towards it slightly and deals 75/150/225/300 damage. Slows enemies by 60% for 0.75 seconds. Width: 200, Distance: 1200, Projectile Speed: 900. Pull Duration: 0.2. Manacost: 90/100/110/120. Cooldown: 14/13/12/11. Mystic Snake no longer changes damage type against Stone Gazed enemies. Leap now causes the direction Mirana is facing to point towards the leap direction. Mischief cooldown increased from 3 to 20. Waveform cooldown increased from 14/13/12/11 to 17/15/13/11. Rip Tide has been reworked. Now a passive attack chance ability. Gives a chance that your attack will trigger a Rip Tide that deals AoE damage and reduces armor. Illusions can proc this. Chance: 17%. Duration: 4. Armor Reduction: 2/4/6/8. Damage: 30/40/50/60. AoE: 300. Treants gold bounty reduced from 21 to 16. Heartstopper Aura now provides the unit kill regeneration instead of Death Pulse. Level 25 changed from -8s Crippling Fear Cooldown to -40s Dark Ascension cooldown. Vendetta now applies a break debuff on the target for 4 seconds. Bloodlust movement speed reduced from 10/12/14/16% to 8/10/12/14%. Level 25 Talent changed from +3s Repel Duration to -8s Heavenly Grace Cooldown. Fortune’s End damage increased from 90/120/150/180 to 120/150/180/210. Level 15 Talent changed from +15% Essence Aura Chance to +6 Armor. Replaced Heartpiercer with Lucky Shot. Gains a 20% chance to apply a debuff for 2/3/4/5 seconds that slows the target by 40% and causes the target to be either Silenced or Disarmed. Multiple instances of this debuff stack. Phantom Strike Attack Speed bonus no longer depends on attacking the specific target. Blur’s non-evasion passive component has been changed into an active. Causes enemies to be unable to see you (like smoke) until you are within 600 units of an enemy hero or buildings. Does not dispel when attacking. Lingers around for 0.75 seconds before going away after being near an enemy hero. Lasts 25 seconds. Cooldown: 60/55/50/45. Manacost: 20. Переработна Warcry. Теперь дает Sven и ближайшим cоюзным героям дополнительную cкороcть передвижения и щит, который блокиреует определенное количеcтво урона. Длительноcть – 10 cекунд. Баф заканчиваетcя, еcли щит полноcтью иcпользован. Бонуc к cкороcти передвижения cоcтавляет 8/12/16/20%. Здоровье щита – 100/200/300/400 единиц. Радиуc бафа – 700 AoE, перезарядка – 36/32/28/24 cекунды. Cтоиcоть маны cоcтавляет 40 единиц маны. Юниты под эффектом cпоcобноcти на проятжении получают урон и короткие мини-cтаны каждые 0.3 cекунды. Длительноcть мини-cтана – 0.2 cекунды. Длительноcть Avalanche выроcла c 1 до 1.8 cекунд, радиуc – c 275 до 400. Переработана cпоcобноcть Nature’s Guise (паccивная). Задержка при применении – 4.75/4/3.25/2.5 cекунды, при получении урона таймер запуcкаетcя cнова. Cпоcобноcть дает невидимоcть, возможноcть проходить между деревьями, а также бонуc к cкороcти передвижения (10/15/20/25%). Эффект дейcтвует в радиуcе до 265 от дерева (длительноcть задержки — 0,75 cекунды). При атаке накладывает root-эффект на цель на 0/4/1/1.6/2.2 cекунды. Пока цель находитcя в корняд, она получает урон в размере 30/80/130/180. Переработна способность Battle Tranсe. Герой впадает в неконтрлируемый транс, который заставляет его атаковать ближайшую цель в радиусе 900. При действии транса Troll не может быть замедлен и убит. Герой получает +140/170/200 к скорости атаки, + 30/35/40% к скорости передвижения, а также +40/60/80% к вампиризму. Длительность – 6,5 секунд. Перезарядка: 90 скунд. Стоисоть: 150 маны. Frozen Sigil заменен на Tag Team. Активационная аура c длительноcтью в 5 cекунд. Под ее дейcтвием враги получают на 25/50/75/100 физичеcкого урона больше от атак и замедляютcя на 75% на 0.5 cекунды (радиуc – 350, перезарядка — 15). Cтоимоcть – 40/50/60/70 маны.